In this amazing video, a Great Dane mama gives birth to eight adorable puppies, all of which immediately cuddle up next to their mom for some lip-smacking nourishment and lots of lovin'. In an email to The Huffington Post Friday, media organization explore.org said that the Great Dane, a service dog named Chaos, gave birth to the healthy puppies on Thursday night. The birthing was captured live on Dog Bless You's Great Dane Service Puppy Cam on explore.org. "The pups have since been cleaned spotless by their mother," the organization writes. The indoor puppy cam will -- at least for the next few weeks -- be focused on these seven new pups and their mom. And in case there was a need for even more Great Dane cuteness, here's a second puppy cam to make your weekend that much less productive. Set atop “puppy hill” at the Service Dog Project training center in Ipswich, Mass., the cam features six other Great Dane puppies that are being trained to provide lifelong support for handicapped war veterans, children, and people with debilitating diseases. Both puppy cams are part of an initiative spearheaded by the Service Dog Project and Dog Bless You, which aims to raise awareness about the great work that service dogs do, such as providing assistance to individuals with mobility impairments and giving comfort to veterans with PTSD. 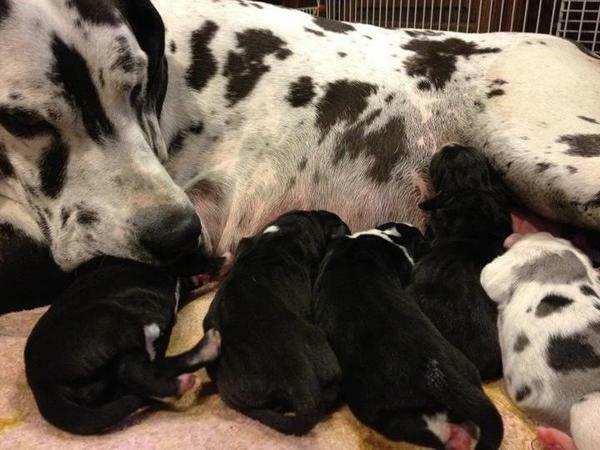 VIDEO chaos gives birth "montage"
Responses to "Great Dane Service Dog Gives Birth To 8 Puppies, Moment Is Captured On Camera (VIDEO) "
Beautiful! I loved watching the spotted pup trying to suckle the ears or anything close by of the siblings...absolutely adorable. What happened to the eighth puppy? He is now a service dog to a man with Parkinson's! I have been down that road a many of times with my golden retriever and another breeder's golden retriever. What was bad was both dogs delivered within less than 12 hours of each other. First was 12 pups, second was 10 pups. Made for a long two days. Sorry. He has Cerebal Palsy.